During the restoration of our collector automobiles, we sometimes come upon a situation where a certain part is purchased and when we receive it, it's not quite as it was advertised. Sound familiar? 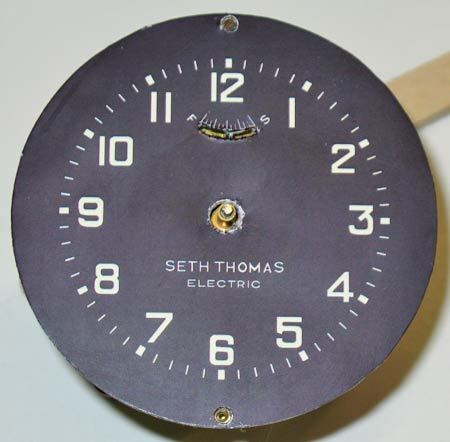 This example of a Seth Thomas electric clock is one of those cases. This particular model clock was used only for eighteen months and is somewhat rare. When one becomes available on the market, the logical response is to purchase it, regardless of its imperfections. The clock's mechanism was found to be mostly working and the local clock repair shop will be able to clean and calibrate it to once again be a reliable timepiece, but the dial face plate has some light damage. There was evidence of smearing of the numbers as well as irregular shades of the back ground black color (Photo 1). There were also some minor paint chips, probably the result of the original black paint being applied to the brass face plate without any primer. You know in your heart that all the time spent under an illuminated magnifier using hair size touch-up brushes won't easily bring back this faceplate the way it was when new. Perhaps the black chips could be color matched and a couple layers of paint might fill them in, but correcting the smearing of the white numbers would be torturous. Rather than fogging up the glass with ones face pressed against the magnifier and trying to use a color palette and a steady hand, the solution that made the most sense was to use the computer with a high grade graphics capability. After all, isn't this dial face plate just another graphics problem? Photo 1 — The Seth Thomas clock face plate as it was received from the seller. Note the water damage to the left side around the number 9. The brass face plate was removed from the clock mechanism and carefully applied to some white card stock being careful to keep the vertical and horizontal alignments perfect. The face plate was then scanned into the computer using the highest density (pixels per inch) setting. The high density setting is important as to ensure that changes made do not appear as jagged or squiggly lines. This would be especially true if the face plate were a more detailed specimen like the Phinhey-Walker dial shown at Photo 2. 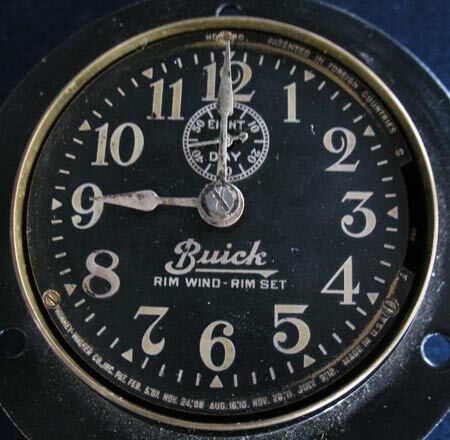 Notice the Buick logo with the swirl in it and the seconds inset dial face with the words EIGHT DAY on it. Recreating these details would be impossible without a computer and a graphics program. 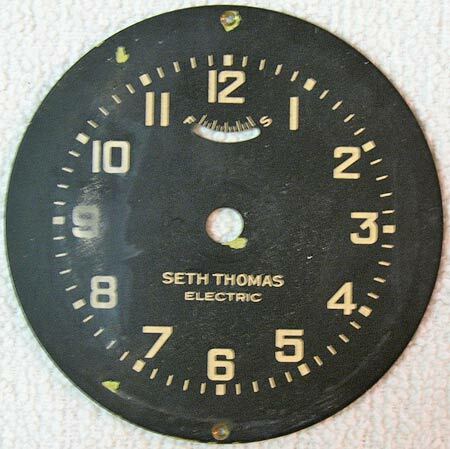 In the case of this Seth Thomas dial face, the letters in the word ELECTRIC were set at 5-6 pixels while the name SETH THOMAS had its letters set at 8-9 pixels wide to be more bold or pronounced. As a comparison, the small lines for the Fast and Slow setting window on the upper portion were a mere 3-4 pixels wide. Photo 2 — Another example of a clock face plate. This Phinhey-Walker clock faceplate includes details such as the Buick logo, the words RIM WIND — RIM SET and the seconds inset dial face with the words EIGHT DAY on it. Recreating or restoring this faceplate would be virtually impossible without the aid of a good graphics program. There are several advantages when using a graphics program such as the one I use from Paint Shop Pro. First is the ability to zoom in and enlarge an area to work on. Since the task involves changing the color of each pixel (and there are thousands of them), working in an enlarged section makes it easier on your eyes and makes it easier to navigate using the computer's mouse. If you stray off course and a line of pixels gets colored wrong, "mousing over" them again is easy, or in a worst case, clicking the "undo" button and starting over. Being able to zoom in and out provides a good perspective on whether the change just made was enough. The second advantage is being able to save the work done at a given moment and being able to come back to it at a later time. Working a graphics problem at the individual pixel level can be tedious and I recommend taking a break once an hour to help you to stay focused on quality. Try doing that with a palette of enamels! A third advantage of the graphics program is to perform something called global changes. In three to four mouse clicks, the color of the white numbers can be changed to reflect something aged and slightly discolored. 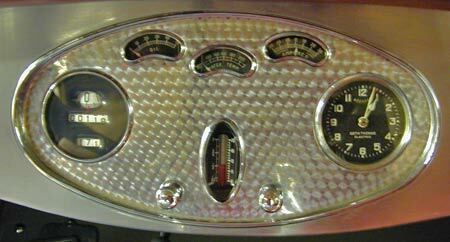 In this example, after several attempts, an off white that had both grey and a light shade of yellow matched the colors of the numbers and letters of the other gauges in the instrument cluster. The result was the effect of aging and all of them appeared uniform. The same also occurred when performing the global change for the black background color, resulting in a nice uniform background. Even the numbers & letters seemed to stand out a little more. The final step was printing the dial face out on photo graphic quality material using a laser color printer and adhering it to the brass face plate. Photo 4 shows the final clock dial face plate. If you don't have a laser printer, save the file to a thumb drive and take it to a nearby Staples or pharmacy that offers Kodak printing and print it as a regular photo. Before printing, be sure that you have that you have correctly sized the scanned image so that when printed it fits the original faceplate. Photo 3 — A side-by-side comparison of the program used to touch-up the Seth Thomas clock dial face plate. On the left is the face plate as it was scanned into the computer and the background color set to a dark shade of black. On the right is the view after all the graphics have been corrected. Each pixel was corrected to be either a light color or dark color and in certain cases the edges between the two colors were set as half tones for blending. Photo 4 — The completed clock dial face printed out on photo quality paper and applied to the clock's original brass face plate. The background is a uniform black color and the numbers & letters were all set to a light grey and beige (off white) to match the slightly faded numbers & letters of the other face plates in the dash board instrument cluster. Photo 5 — The completed instrument cluster with the Seth Thomas clock installed. The clock's chrome bezel and glass hide the outer edges of the faceplate. The other gauges faceplates were in excellent condition with only the clock's faceplate requiring attention. Not restoring this faceplate would have ruined the appearance of the entire instrument cluster. This is a relatively simple method for restoring the faceplates of instruments and gauges for your project, whether you need to do one or all the gauges. If your restoration project deviates from total originality and you desire to customize it, this is a good opportunity to add logos like was originally done with the Buick script in Photo 2. You could add a Chevy Bow-Tie to each gauge faceplate. This is also an opportunity to create something new such as a wall or desk clock that is personalized for a fellow collector. What was unusable for some restorers now takes on a new life for someone else.